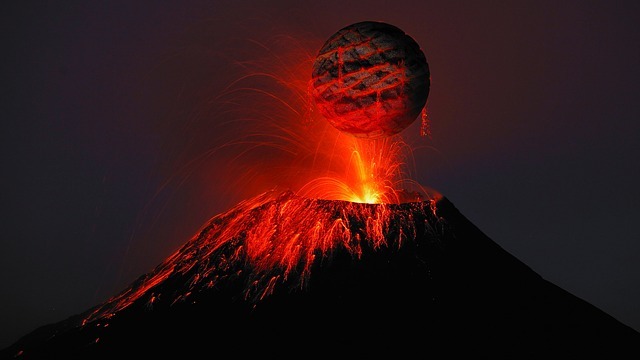 Volcanoes are ruptures in a planet’s crust that form because of upwelling magma or molten rock. The magma collects in a magma chamber near the surface. Gas released from the magma in the chamber creates pressure within the chamber which eventually creates a breach in the rock, resulting in a volcanic eruption. Some volcanoes produce eruptions that are more explosive and produce more debris. Others produce eruptions which result in more lava flows. Volcanoes are found on many planetary bodies of the Solar System, including Earth, Mars, Io, and Venus. There is also evidence of cryovolcanoes, volcanoes that erupt volatiles such as water and ammonia that produce ice instead of rock, on icy bodies of the outer Solar System such as Neptune’s moon Triton and Saturn’s moon Enceladus. Volcanoes can be classified in many ways. Two ways that volcanoes are often classified is by eruption type and morphology. There are many different morphological types of volcanoes, but three common types are shield volcanoes, stratovolcanoes, and cinder-cone producing volcanoes. There is also a variety of different eruption types. Some eruptions produce more explosions and debris. These are naturally called explosive eruptions. Other eruptions produce more lava flows. These are called effusive eruptions. Cindercones are cone-shaped vents of a large volcano made of piles of volcanic glass shards such as scoria that quickly emerge out of the ground from continuous explosive eruptions in which molten rock is “spit” out of a vent and quickly becomes solidified. These volcanic features are common in rift basins where the crust is thin, allowing magma to easily breach the surface. Shield volcanoes are dome-shaped volcanoes that get their name from resembling a shield laid on its side. They are usually composed of sequential lava flows stacked on top of each other. Mauna Kea in Hawaii and the Tharsis volcanoes on Mars are examples of this type of volcano. These are volcanoes that contain multiple layers of different types of volcanic material. They contain large amounts of volcanic debris like cinder-cone producing volcanoes and extensive lava flows like shield volcanoes. Famous stratovolcanoes include Mount Fuji, Stromboli, and Mount Saint Helens. Volcanic eruptions vary depending on rock composition, the amount of magma, gas content, and the tectonic setting. Hawaiian eruptions consist mainly of lava flows. These types of eruptions are common on volcanic islands and at places where the magma has a particularly mafic, specifically basaltic, composition such as oceanic island arcs and on ocean islands near hotspots. The magmas associated with Hawaiian eruptions also have low gas content. Places on Earth where Hawaiian type volcanic eruptions are common include Iceland, Hawaii, and similar locations. The Martian volcanoes in Tharsis, Olympus Mons, Tharsis Montes, Ascreaus Mons, and Arsia Mons, are also probably from Hawaiian style eruptions which occurred on a much larger scale than their terrestrial counterparts. A vulcanian eruption is similar to a strombolian eruption except that the eruptions are more explosive and the periods of quiescence separating eruptions are longer. Magmas in vulcanian eruptions are more felsic than strombolian or Hawaiian style eruptions. Felsic magma, such as rhyolite, traps more gas than mafic magmas and, as a result, volcanoes with felsic magma tend to be more explosive. This makes vulcanian eruptions larger and more powerful than Strombolian eruptions. The most powerful common eruption which occurs on Earth is a Plinian eruption. Plinian eruptions occur when the magma is even more felsic than in vulcanian eruptions and even more gas is trapped. Plinian eruptions produce columns of volcanic debris that can be as high as 45 kilometers. Columns that are higher than about 30 kilometers have long term effects on climate and thus these eruptions are important for paleoclimate studies. Plinian eruptions were named for Pliny the Younger who observed the Plinian eruption resulting from Mount Vesuvius which destroyed Pompeii in A.D. 79. Other famous Plinian eruptions include Tambora and Krakatoa. Active volcanoes are most common at active plate boundaries and hotspots. The plate boundaries where volcanism is the most common are convergent plate boundaries such as subduction zones where an oceanic plate is being subducted beneath either lighter oceanic crust or continental crust since continental crust is always less dense than oceanic crust. Volcanoes are also common in continental rifts where the crust becomes thin enough that magma can easily breach the surface. These are the areas where volcanic hazard is the greatest. Eruptions can be very destructive to local human communities. The hazards from volcanoes include mass wasting, ashfalls, and falling debris. Mudslides can occur when a mass of muddy material becomes detached from the slope of a volcano and slides in a coherent unit. Such mudslides can be very destructive to nearby towns. Mudflows can also be triggered by volcanic eruptions and occur when the mud behaves as a fluid creating a river of mud. Mud flows are very dense and can carry boulders at high speeds. Lahars are mixtures of mud, volcanic debris, and water. Their temperatures are hundreds of degrees Celsius and they move at very high speeds. They are among the most destructive forms of mass wasting associated with volcanic eruptions. Explosive volcanic eruptions can produce copious amounts of ash sized particles which can be carried great distances by wind. Ash can cover roofs and ground and is very difficult to clean. Volcanic ash is also very sharp and jagged and can damage car and plane engines as well as the lungs of animals and humans. In explosive eruptions, molten rock and mineral crystals that already solidified within the magma can be ejected at high speeds. They range in size from ash-sized to pebble-sized in the case of lapilli to a meter, or more, across in the case of blocks and bombs. Flying volcanic debris is also dangerous as it can collide with buildings and other objects as well as with humans. There is no way of predicting exactly when an eruption will occur but there are signs that show that a volcanic eruption is imminent. These include, earthquake swarms and the bulging of the slope of the volcano. When molten rock moves through chambers beneath the surface, this can cause a cascade of earthquakes as the molten rock moves against the walls of the chamber. This doesn’t necessarily mean that an eruption will occur, but it does mean that molten rock is moving and may be moving towards a volcanic vent. Because of the gas and magma nearing the surface of a soon-to-erupt volcano, the slope of the volcano may appear to bulge or deform as gas and magma push against the rock. This bulging is usually only detectable by tiltmeters. Most volcanoes near population centers have teams of volcanologists who monitor them and warn of potentially dangerous activity. There is also a color-coded system used by volcanologists to indicate the degree of danger of a volcanic eruption. Earthquakes occur when the surface is shaken or disturbed in some way due to interior processes within the earth. Earthquakes are usually caused by slipping between two bodies of rock along a fault. This slipping will result in seismic waves. Similar quakes might also occur on other planets. The two types of waves involved in the cause of earthquakes are surface waves and body waves which travel through Earth’s interior. The two types of body waves are p-waves and s-waves. P-waves are longitudinal waves, meaning that the oscillation caused by the wave is parallel to the propagation of the wave through rock. They can travel through both solid and liquid components of the earth or another planetary body. As p-waves move through rock, the material will become compressed at the crests of the waves and extended at the troughs. S-waves are transverse waves, meaning that their oscillation is perpendicular to their propagation. S-waves are slower than p-waves. In fact, the “s” in s-wave means “secondary” while the “p” in p-wave means primary since s-waves will arrive after the p-waves. Unlike p-waves, s-waves can only travel through solid material and will not travel through liquid or air. One of the reasons that geophysicists know that Earth has a liquid outer core is that there is a region within Earth’s interior from which seismic detectors do not receive any s-waves, only p-waves. Surface waves can come in a variety of forms. The two types of surface waves are waves which cause the ground to move laterally and waves which also cause a vertical oscillation of the ground. Surface waves that move the ground laterally are called love waves. Surface waves that also cause a vertical oscillation of the surface are called Rayleigh waves. Earthquakes are caused primarily by plate movements and movements along faults. Faults are essentially cracks in Earth’s crust that are actively deforming as bodies of rock on either side of the fault slide against each other. This movement of bodies of rock is the basis of plate tectonics. Earthquakes are typically caused by movement of bodies of rock along faults. There are three types of faults where earthquakes cluster. Normal faults, reverse faults, and transform faults. Normal faults are faults where two tectonic blocks or bodies of rock are being pulled away from each other. These faults occur in regions of extension such as rift basins and at mid-oceanic ridges where tectonic plates are diverging from each other. These faults are also apparent on other planetary bodies such as Mars in the Valles Marineris region. Reverse faults occur where two tectonic blocks are pushing against each other. This can cause one block to be thrust upward and over another block. This type of fault is common at subduction zones and at wrinkle ridges on planetary bodies such as Mercury, the Moon, and Mars, where cooling of the planet has caused contraction of the crust. Reverse faulting is, as a result, associated with compression. Transform faults occur where two tectonic blocks move laterally with respect to one another. A well-known example of a transform fault is the San Andreas fault in the U.S. state of California. Oblique faults exhibit both reverse/normal and transform movement of the associated tectonic blocks. Most major faults have segments which show varying degrees of obliquity. As tectonic blocks move along faults, they don’t move continuously. As blocks slide against each other, they get caught on protrusions along the walls of the fault surface called asperities. Once they get caught, pressure builds up on the asperities until finally the asperities locking the two bodies of rock together break or melt, causing the blocks to slide again. This breaking of the asperities and subsequent sliding of the blocks produces an earthquake. Because of the nature of earthquakes, it is almost impossible to predict when an earthquake will occur. The best that can be done in most cases is to avoid constructing buildings where earthquakes are likely to occur such as along faults and to design buildings in areas where earthquakes are common to withstand them. The Richter scale is a scale used to calculate the magnitude of an earthquake. The magnitude of an earthquake is the energy released during the event. Most earthquakes are not higher than magnitude 9. Very rarely there will be magnitude 9+ earthquakes which are some of the most destructive earthquakes that have occurred in Earth’s history. The magnitude of an earthquake is constrained by the length of the associated fault. 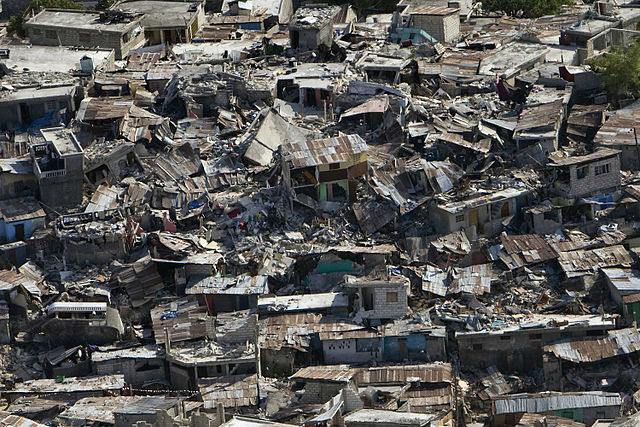 There is currently no fault on Earth large enough to sustain a magnitude 10 earthquake. Volcanoes and earthquakes are both related to a rupture that occurs in rock near or at the surface of a planetary body. Both are also phenomena of geological origin that present serious hazards to humans. Volcanic eruptions and earthquakes are also both difficult to predict. 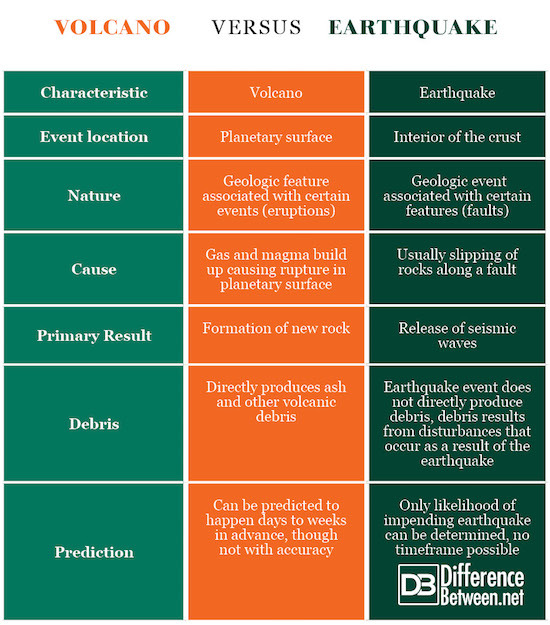 Although there are similarities between volcanoes and earthquakes, there are also significant differences which include the following. Volcanoes form at Earth’s surface whereas earthquakes originate from deeper within the crust. Volcanoes are also features of planetary surfaces whereas earthquakes are just events though they are associated with certain features such as faults. Volcanoes are formed by release of gas and magma. Earthquakes are caused by movement along a fault. Volcanoes lead to the formation of new rock whereas earthquakes simply cause waves which disturb the rock. Volcanoes can produce significant debris through ashfalls, mudslides, and the formation of features such as ignimbrites. Earthquakes typically will not directly produce significant debris, but debris will result from the disturbances caused by the earthquake. It is possible to predict a volcanic eruption a few weeks to a few days in advance, though the exact time of the eruption can’t be predicted with any accuracy. The likelihood of an earthquake can be predicted, but it is not possible to determine any timeframe of when the earthquake will take place, just how likely it is to happen at some point in the future. Volcanoes form when magma comes to the surface and causes a rupture in the surface allowing for a vent to form. They are classified based on many factors including, but not limited to, morphology and the scale of the eruption. The scale of the eruption is controlled by the composition of the magma and the amount of gas trapped within. Earthquakes are usually caused by slipping of bodies of rock on a fault. Volcanoes and earthquakes are similar in that they are both geological in origin and both result in surface phenomena. They also both represent significant hazards to humans They are different in that volcanoes erupt because of processes that occur very near Earth’s surface while earthquakes are usually caused by disturbances which often originated at least hundreds of meters below the surface of a planet. Volcanoes are also features that can produce numerous related events whereas each earthquake is just a geological event. Furthermore, volcanoes result in the formation of new rock whereas earthquakes result in seismic waves and shaking of rock but not formation of new rock. Also, volcanoes can be predicted to erupt within a few days to weeks, though an exact time cannot be known and predictions can be wrong, whereas only the likelihood of an earthquake can be predicted. It is impossible to determine a timeframe for the when the next earthquake will occur. Caleb Strom. "Difference Between Earthquake and Volcano." DifferenceBetween.net. July 23, 2018 < http://www.differencebetween.net/science/nature/difference-between-earthquake-and-volcano/ >. Bullard, F. M. "Stromboli, lighthouse of the Mediterranean." Alcalde (University of Texas) 42 (1954): 284-289. Wilson, Lionel. "Volcanism in the solar system." Nature Geoscience 2.6 (2009): 389. Brand, Brittany D. "EA Parfitt, L. Wilson: Fundamentals of physical volcanology." (2010): 375-375.